Not-for-profit entities with 12/31/18 year-ends will be implementing ASU No. 2016-14, Presentation of Financial Statements of Not-for-Profit Entities in their financial statements. With limited exceptions (related to comparative financial statements in the areas of the new functional and natural expense analysis and the new liquidity and availability disclosures) ASU No. 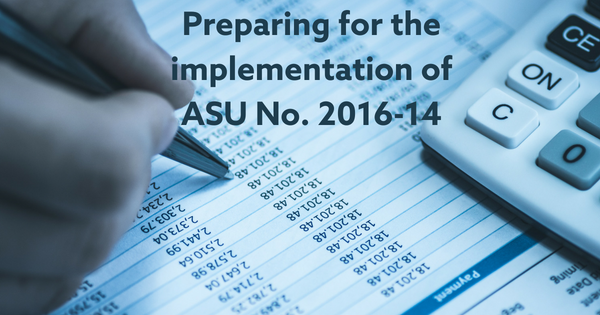 2016-14 is required to be applied on a retrospective basis in the year that ASU No. 2016-14 is first applied. A retrospective application entails the application of a different accounting principle to one or more previously issued financial statements, or to the statement of financial position at the beginning of the current period, as if that principle had always been used. Thus, in implementing ASU No. 2016-14, not-for-profits will need to reclassify their opening balances of net assets as if ASU No. 2016-14 had always been used. In reclassifying their net asset balances, not-for-profits need to focus on the following items: (1) the renaming of “unrestricted net assets” as “net assets without donor restrictions”; (2) the renaming and combining of “temporarily restricted net assets” and “permanently restricted net assets” as “net assets with donor restrictions”; (3) the change in reporting for underwater endowment funds; and (4) the elimination of the implied-over-time option for gifts related to capital assets. Not-for-profits will also need to disclose information related to the net asset reclassifications and auditors will need to consider the inclusion of an emphasis-of-matter paragraph under AU-C section 708, Consistency of Financial Statements. Sign up for The Essential Course for Preparing Not-for-Profit Financial Statements Under ASU No. 2016-14.